Your customers will just go wild on seeing this customized tennis racket shape bottle opener sports keychain. Offer it during next tennis match in the locality or push it with sales at your sports store. This tennis racket shape bottle opener keychain steals attention with its tennis racket shape and offers reliability as a key holder and bottle opener. It serves best for small budget marketers who expect to play long shots at small investment. You can considerable savings by ordering this sports keychain in large numbers. 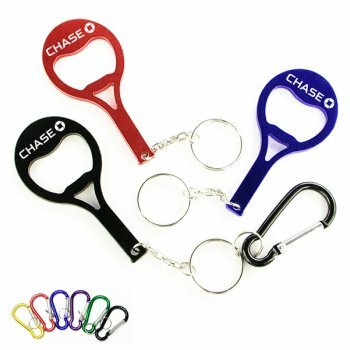 Request a quote to know price savings on custom tennis racket bottle opener sports keychain. Features – Tennis shaped aluminum body in metallic finish. Product Size – 3 1/8" x 1 1/2"
Available Colors - Metallic Green, Metallic Blue, Metallic Black, Metallic Gold, Metallic Pink, Metallic Purple, Metallic Red and Metallic Silver. Imprint Method - Laser Engraving, Full Color Process, and Printed. Imprint Area :1" x 3/8", 5/8" x 1/8"
Product Size :3 1/8" x 1 1/2"